Provide comfort for the family of Clementina Furlan with a meaningful gesture of sympathy. In Loving Memory of Clementina (nee Comacchio) Furlan, 80 years, passed away April 2nd 2019 peacefully with loving family at her side. Beloved wife of 58 years to Albano Furlan. Loving mother of Carla (Peter), David (Joan) and Robert (Cathy) and cherished Nonna of Andrew (Trisha), Mae Lynn (Rory) and Brenden. Dear daughter of Giuseppe Comacchio and Giovanna (Martinello), both predeceased. Sister to John (Jeannine predeceased), Judy (Roland predeceased) and Linda (Klaus). She will be missed by many nieces and nephews. 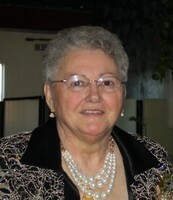 Clem was actively involved in the creation of Sudbury Branch 42 of the Canadian Diabetic Association and served as second vice-president during its installation. She remained a great supporter to the cause in hope of finding a cure. A devout Roman Catholic, Clem was a long-time parishioner of St. Paul the Apostle Church and for 56 years, an active member of the parish CWL. Clem’s beautiful voice graced the parish choir for many years. A Coniston Lioness and Lion, Clem participated in many fundraisers. She gave generously of her time and energy and helped many families in need in the community. She was a great cook and loved to host family dinners and have everyone enjoy the enormous amount of food that she lovingly prepared. Nobody could beat her polenta and toccio or her risotto. Her culinary finesse was also welcomed at the Club Allegri in Coniston, where on most weekends you would be able to find her in the club’s kitchen cooking for a wedding or some other special occasion. Resting at the Jackson and Barnard Funeral Home, 233 Larch Street, Sudbury. Friends may call from 2-5 and 7-9pm April 5th, 2019. Funeral Mass at St. Paul the Apostle Church, 25 Edward Street, Coniston on Saturday, April 6th, 2019 at 11 am. Internment at the Civic Memorial Cemetery, 2nd Avenue, Sudbury. In lieu of flowers, donations to the Canadian Diabetic Association would be appreciated. To send flowers in memory of Clementina Furlan (Comacchio), please visit our Heartfelt Sympathies Store. Donations are being accepted for: CANADIAN DIABETES ASSOCIATION/ASSOCIATION CANADIENNE DU DIABETE (CANADIAN DIABETES ASSOCIATION/ASSOCIATION CANADIENNE DU DIABÈTE). Consider providing a gift of comfort for the family of Clementina Furlan by sending flowers. We encourage you to share your most beloved memories of Clementina here, so that the family and other loved ones can always see it. You can upload cherished photographs, or share your favorite stories, and can even comment on those shared by others. Dear Albano, Carla, David and Robert, and families I am so sadden to read of the passing of Clem. All of you are in my thoughts and prayers at this sad time. She was a lovely lady and I treasure the memories of her being my neighbour when I was growing up. I remember her and my Mom talking through the kitchen window in the back of our house and I working with her at the Club Allergi . She will be missed.